Even though I only met you a few times, and even though you have been gone for seven years now [which is why I’m putting this out into the ether rather than writing you in person], I had a dream I wanted to share. I’m pretty sure it pertains to you so here’s what I remember. It was nighttime; small bare bulbs hung up on strings unevenly casting light and shadows around a large room. There was an owl perched on a platform and that platform [as it went through the shadows] turned into an outdoor terrace. I looked at the owl again and saw that it was blessed with unusually hooded, luminous and memorably sad eyes, as if they had perhaps seen too much stupidity in its world. I was surprised to see that the owl’s body language was in contrast to its weary eyes. The owl seemed engaged and aware; its beak was shiny, textured and moved over its mouth; its head turned while its scapular feathers ruffled, as if in a breeze. In the dream, I spoke with the owl wordlessly, telepathically, following the fuzzy logic of REM sleep. In this way, I learned that the owl was thinking about embarking upon a fresh journey of discovery; he communicated that other places, faces and spaces captured his attention. And with that I suddenly realized I was not alone in my dream; there were a number of other birds around, and the younger birds looked to the owl for signals about when to take flight, about how best to fly and which of all the possible directions they should head in. A few of the bolder birds gathered directly underneath the now-outstretched wings of the owl. I could tell that they were calling loudly even though I couldn’t hear them. Regardless of what went on around him, the ancient-looking owl had an unusually relaxed and knowing manner. To some of the birds, he responded with a hoot or two; for others, a gesture sufficed, a shake of the wing; for still others, a more intricate semiotic seemed to be in play: the owl turned to show a faded white belly, to raise and lower its supercilium [joined eyebrow], and this part doesn’t make any normal sense, either, but the feathers that radiated from around those eyes seemed to rotate. It was trippy. When I had this dream, it was 2006; a year later you died. I never knew what to do with this dream, if anything, but then yesterday I re-read your essay, the one called “When I was a little boy” and it was like you were right there in the room. At first, I couldn’t help but feel that this dream was some sort of larger message. But that wasn’t your way. You usually sent smaller, more frequent messages disguised as bowls, lights, bookcases, chairs, totems, vases and the like, and now that I recall that folklore and literature associate owls with wisdom, I believe that you were the owl of my dream. 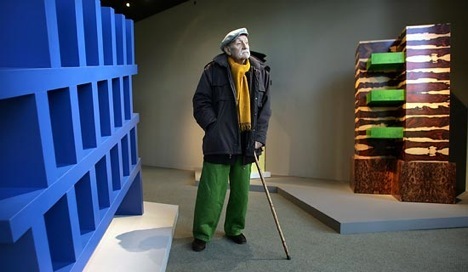 Born in 1917, Ettore Sottsass died in 2007, but only after changing not just how we design but what we consider design to be and to be capable of. The Professor will always appreciate Kathryn B. Hiesinger’s Design Since 1945 book [and exhibition] wherein she asked Sottsass and Swiss designer Max Bill the same questions and then juxtaposed their wildly divergent responses; reading that [in 1983] changed how The Professor saw the world. The Professor recommends Sottsass’s own Design Metaphors, a later book documenting [mainly through photos] a protracted nomadic period when he lived in a tent in the Pyrenees—away from Milan, people and the hustle and bustle of commercial work—an upheaval so profound that it recast what he thought was important, and in doing so, became the conceptual fodder for his later Memphis projects. And that’s why they call him The Professor.